We manufacture our products after the order. This means that every item in our store is unique and made with extra care and love. Production on demand enables us to minimize the risks of price volatility and fluctuations in cryptocurrency and allows us to price our products competitively. We ship worldwide internationally from our fulfillment centers in the USA and Europe. The shipping and the fulfillment time have to be taken into consideration together when estimating the delivery period. We ship internationally to all countries, except Cuba, Falkland Islands, Iran, North Korea, Somalia, and Sudan. These countries are excluded since our shipping carrier can’t guarantee delivery to those countries. As a company which does not believe in borders, we will do our best to enable delivery to these excluded countries as well. International shipments may incur customs fees. For each country the customs policy is different, and the fee is determined based on a variety of factors like weight, value, and size. 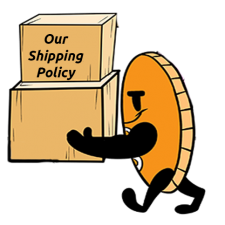 We do not take responsibility for customs fees. When placing the order in our store, you agree to pay the customs fees for your country if any occur. If you are unsure about the costs of import taxes for your country, contact your local customs office. If your order didn’t arrive within our estimated delivery deadline, be sure to let us know! First, check your shipping confirmation and verify that you provided the correct address. If the address was incorrect, though we’d be happy to send you another order to the correct address, it will have to be at your cost. If the shipping address was correct, please contact your local Post Office with the tracking number of your item and see if the item is stuck on the customs. Be sure to get in touch with us with your order number and we will see what can be done.